Even if you only have a few minutes, you can make breakfast. That's why we partnered with Great Nations Eat for this post. Pancakes are such a treat, but sometimes you don't have time to stand over a hot griddle. 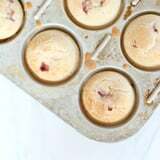 Make it simple and bake them in muffin tins for a fun spin on this breakfast favorite. Fresh strawberries are lovely in the morning and using premade pancake mix makes for seriously easy eats. Preheat your oven to 400˚F. Add the pancake mix and water to a mixing bowl and stir until smooth. Lightly grease the muffin tin, then evenly distribute the strawberries. Pour batter over strawberries, then bake for 10 to 12 minutes, or until the pancakes are set. Want more muffin tin recipes? Click here for more.